1. Halve or quarter any large potatoes then cook them in a pan of boiling water for 10–15 minutes until tender. Drain and allow to cool slightly. 2. For the dressing, whisk or shake together the mustard, lemon juice, olive oil and caster sugar. Set aside. 3. Pull a fork lengthways down the cucumber all the way around then thinly slice. 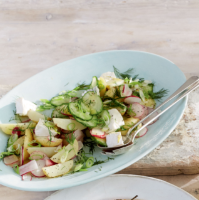 Place in a large serving dish with the leaf salad, radishes, salad onions, cooked potatoes and dill. 4. Fold through the dressing and goat's cheese and serve.